23 November 2010, at 2:28p.m. GREECE - More than 130 people working in the poultry breeding sector in Greece and Cyprus took part in a seminar organised by Anitec in cooperation with Cobb Germany at the Hotel Du Lac at Ioannina. 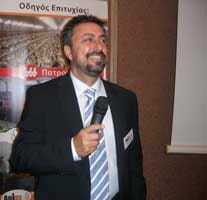 Ilias Alexiou, Anitec's general manager with a 16-year association with Cobb, welcomed the delegates and introduced James Truscott, director of Cobb Germany, who emphasised the efficiency of Cobb birds at both breeder and broiler level. "The breed has an outstanding feed conversion rate and an advantage in being able to thrive on low density feeds," said Mr Truscott. "That's why the Cobb 500 is the world's most popular broiler and why our sales at Cobb Germany are increasing significantly year by year." Ron Meijerhof, technical consultant of Cobb Germany, spoke about the scientific background behind the principles of good breeder flock management. Veterinarian, Dr Matthias Todte, spoke about breeder vaccination and how the current threats to breeder health are being confronted. 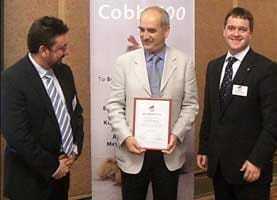 The seminar ended with Mr Alexiou presenting awards for the best performing Cobb flocks for 2008 and 2009. The winners Nikolaos Lalagiannis (production manager of Lalayiannis SA) and Ioannis Papadimitriou (farm owner of Koutsos-Tzotzas S.A company) received their prizes of one-week holidays for two on a Greek island of their choice.